The geologic history of this part of Illinois is here sketched only in the barest outline. The rock forming the substructure of this region may be seen in numerous quarries about the city, and is reached by all borings which pass through the drift. The formation exposed at the quarries and first reached in borings is the Niagara limestone. Where these borings have penetrated to depths of several hundred feet, not only one but several great rock formations are found, limestones, sandstones, and shale overlying one another in alternating series. These are the deposits of early geologic ages. The thickness, character, and general stratigraphic relations of the great sedimentary rock formations underlying this area, as determined by borings for artesian wells, are shown in figs. 2 and 3. All the deepest wells in this region terminate in the midst of a great sandstone formation, the Potsdam sandstone, This is the lowest known rock formation in the State, and is shown at the bottom of the section. Some of the wells penetrate this sandstone several hundred feet, but none pass through it. In parts of Wisconsin it has a thickness of 1,000 feet. What underlies this sandstone here is not known. When these formations are traced northward into central Wisconsin it is seen that they gradually rise and, one after another in the order of the succession downward, thin out and disappear as the next formation below rises to the general rock surface, until at length even this lower sandstone reaches the surface, spreads over a great area, thins out, and disappears. From beneath this sandstone there appear crystalline rocks yet remoter age. It is believed that these latter rocks everywhere underlie the formations found by the well borings beneath the Chicago area, and that their erosion originally furnished the material from which the overlying sedimentary formations were made. This lower group of sediments, the Potsdam sandstone, which is very widely distributed in the United States, is of later Cambrian age. Since this is the earliest of the Paleozoic formations in the northern interior, it is evident that a large part of the continent was land area and was exposed to denudation while the earlier Cambrian formations were being deposited in the eastern and western seas. With the opening of later Cambrian time, however, the ocean advanced upon the land from the south, until of all the northern interior of the United States, only the northern half of the area of Wisconsin and parts of northern Michigan and Minnesota remained above water in this ocean was a characteristic fauna, and in the shallow waters along the advancing shore lines the Potsdam sandstone was deposited, much as great beds of sand are now being deposited along sea shores. That the deposit was made in the ocean and no in an inland lake is shown by the fossil marine fauna, found where the rock outcrops. Whatever may have been the character of this Wisconsin land and its altitude relative to the advancing Cambrian sea, it is evident the reaction was such that the erosion of its surface and the deposition about its shores gave rise to a very extensive sand bed of considerable thickness. There appears to have been more or less variation in these conditions, so that in some places beds of limestone and beds of shale occur in the upper part of the formation. The well at Chicago Heights shows 190 feet of limestone and shale in the uppermost part of the Potsdam formation and above this 250 feet more of sandstone, making 1,064 feet of rock to be referred to this group. This bed of limestone and shale indicates an interval of deeper waters, free from beach sands. The limestone probably is to correlated with a similarly located but thinner bed in Wisconsin, known as the Mendota limestone, while the upper 250 feet of sandstone may be correlated with the Madison sandstone of Wisconsin. Well section of Potsdam rocks at the Joliet Steel Mills. These sections show deposition in water somewhat deeper than that which covered the region lying farther east, for instead of so much shore sand, finer silts were deposited. Overlying the beds of the Potsdam group is a magnesian limestone formation 160 to 450 feet thick. This formation thickens toward the south and southwest, being 350 feet thick at the Chicago Heights well and 450 feet thick at Joliet. As a general rule, however, clearer waters prevailed and a new and different fauna was developed. While it is probable that the Lower Magnesian limestone was derived from the calcareous residue of this marine life, well-preserved fossils are very rare in it. The dolomitic character of the limestone is held by some to have been due to contemporaneous deposits from the magnesian salts of the sea water, and by others to have been due to subsequent alterations. A return to conditions favorable to the deposition of sands and to changes in the fauna of this region marked the formation of the St. Peter sandstone, which overlies the Lower Magnesian group. This is a very porous, white sandstone, varying considerably in thickness. It ranges from 60 feet thick where it is reached in wells at Goose Island in North Branch of Chicago River, about 2.5 miles northwest of the Chicago Harbor inlet, to 200 feet at Chicago heights and 450 feet at South Evanston. Limestones of the Trenton group were deposited in this region during the period which next followed. In the clear waters of this Trenton sea lived a prolific and varied fauna, as we may judge from the fossil remains at places where the rock is not exposed at the surface. This fauna consisted of corals, crinoids, mollusks, crustaceans, and other invertebrates. The limestones are mostly magnesian. Wells in the vicinity of Chicago show strata 270 to 390 feet thick, referable to this group. The upper part of the formation, known as the Galena limestone, is the lead-bearing formation of northwestern Illinois. The lower part is known as the Trenton limestone. Overlying the Trenton limestones is a formation composed of thin-bedded shales or mud stones. These are, for the most part, composed of the fine, muddy sediments carried into the sea by the drainage of the land. It is possible that these fine sediments so polluted the water as to have a marked effect upon the living organisms therein. At any rate, there was a marked change in the fauna; new species came in, and such as could not adapt themselves to the new conditions were extinguished or forced to emigrate. Under the Chicago area this shale formation is shown by wells to vary in thickness from 105 to 250 feet. It was found to have a thickness of 250 feet at the first Union Stock Yards well. A 20-foot bed of limestone occurring in the formation at this place shows an interval of clearer water. At the close of the Hudson epoch two great islands developed in the interior continental sea in the region of Indiana, Ohio, Kentucky, and Tennessee, which very materially affected the rock-making conditions. No marked disturbances of the strata are found in the vicinity of Chicago, but the sea was withdrawn for a considerable period, as is shown by the fact that formations which were elsewhere deposited between the Cincinnati group and the next overlying formation show that an interval occurred in which the marine fauna was almost entirely changed. When the sea again submerged the area a fauna composed almost entirely of new species made this their habitat. Upon the Hudson shale lies a great limestone formation, the Niagara limestone, which immediately underlies the drift throughout this region (figs. 2 and 3.) This formation here varies in thickness from 254 to 409 feet, and it is probable that even this is not its original thickness, since there was a great opportunity for erosion before it was covered by the protecting mantle of drift. During the deposition of this limestone clear water conditions prevailed over wide areas and a new and wonderful fauna developed [The Silurian fauna interpreted on the epicontinental basis by Stuart Weller: Jour. Geol., Vol. VI, 1898, pp.692-703]. Just where this new fauna came from is not known, but a careful study of the distribution of the rock of this age and of the forms of life represented has led to the suggestion that the interior sea extended far northward and connected with Europe across the polar regions, and along the shores of this sea the species may have come to the region of northeastern Illinois. 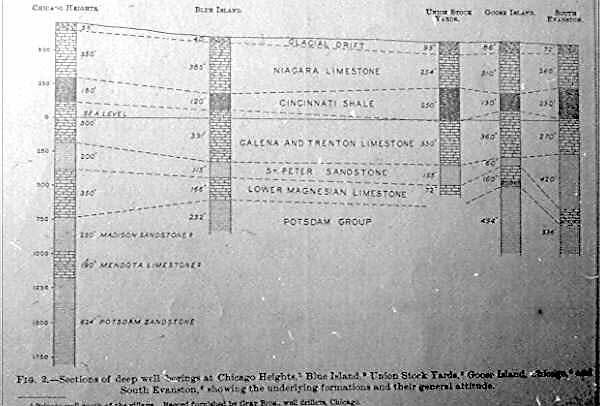 Since the Niagara limestone immediately underlies the drift throughout the Chicago district, there is abundant opportunity for its examination and study at the numerous quarries and outcrops. About a mile northwest of Humboldt Park, corner of North Central Park avenue and Humboldt avenue, the Niagara limestone rises in a gentle knoll which has a relief of 4 or 5 feet. The rock is here thinly covered by clay and is exposed only in spots, so the dip could not be read. Two blocks west of Humboldt Park, at the intersection of Homan and Frederick avenues, is a small lenticular elevation of rock, lying in a northeast-southwest direction, having a relief of 4 or 5 feet. It is but slightly exposed, because of the clay covering, and no reading of the dip could be taken. At the intersection of Chicago and Western avenues, about three-fourths of a mile southeast of Humboldt Park, is a low elevation of rock, partially exposed above its thin covering of clay and having a relief of 5 to 7 feet above the flat to the east. Near Grand and Campbell avenues are two quarries having depths of 80 to 90 feet. The rock as here exposed is a massive gray dolomite, much fractured, so that the product of the quarries is crushed stone for paving and rubble for foundations and lime, no dimension stone being available. The term "marble," as used here evidently means even-grained, close textured limestone. About a mile east of Douglas Park, at the intersection of Nineteenth and Lincoln streets, is the quarry of the Chicago Union Limeworks Company. The section here shows 10 to 15 feet of bowlder clay over the limestone. The quarry is about 175 feet in depth. Mr. T. W. Phinney, president of the company, states that the limestone here is a dolomite with about 54 per cent carbonate of lime and 44 percent carbonate of magnesia, affording very strong lime. The strata are 1 to 6 feet in thickness, with thin seams of clay one-fourth of an inch or less in thickness. The beds are nearly horizontal, and so much fractured that no dimension stone is quarried. At a depth of 200 feet the character of the rock changes, showing about 10 per cent of silica, with so much less of the carbonate of lime and magnesia. The rock here does not show the presence of petroleum. In the first and second blocks east of the quarry are small outcrops indicating a thin covering of the rock in this vicinity, and about one-half mile south, near the corner of Robey and Twenty-third streets, the rock for several blocks is exposed or but thinly covered. In the part of the city known as Bridgeport, about 1.25 miles farther southeast, at Twenty-seventh and Halsted streets, south of South Branch of Chicago River, is the quarry of the Stearns Lime and Stone Company. The rock is massive concretionary limestone showing little appearance of stratification. It varies in character from a loosely compacted clayey rock to a solid bluish-gray limestone. The locality is especially rich in organic remains and has yielded many fine fossils. At Hawthorne, on the Chicago, Burlington and Quincy Railway, west of Chicago, is the quarry of Dolese & Shepard. The excavation here is 60 to 70 feet deep and shows definitely bedded, gray limestone, massive below, weathering yellow. The strata dip strongly in the direction S. 46 degrees E, the angle of dip varying from 10 degrees to 40 degrees. The beds are much fractured and hence furnish only crushed stone, lime, and cement. The rock is highly fossiliferous, especially in the upper layers, where it is composed largely of fragments of fossil organisms. On the lake shore at Windsor Park, at the foot of Cheltenham place, is an outcrop of the Niagara which is well saturated with petroleum. It is but thinly covered for several blocks back from the shore, so that excavations made for sewers are partially in rock. Two small outcrops occur on Railroad avenue, between Seventy-fourth and Seventy-fifth streets, in Windsor Park, and a third about six blocks west, between Seventy fifth and Seventy-sixth streets. These outcrops are not shown on the map. 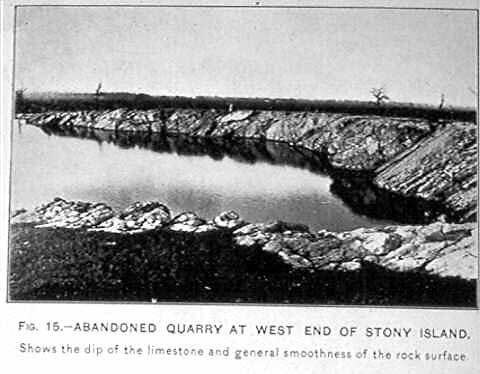 Stony Island, 1 mile north of Lake Calumet - Farther south, at Ninety-Second street and Stony Island avenue, a mile north of Lake Calumet, is one of the most interesting exposures within the area, a rock elevation locally known as Stony Island. This exposure is a somewhat elliptical ridge, 1.25 miles long and one-half mile wide, with the long axis in an east-west direction. It has a relief of 20 to 25 feet above the surrounding marshy plain. The limestone is exposed almost continuously about the margin of this ridge, though the main part is covered by a thin coating of bowlder clay and gravel. On the northwest side of the elevation, at Ninety-second street and Stony Island avenue, is an old quarry which gives an excellent 15-foot section (fig. 15). The rock, which is a gray, fossiliferous, magnesian limestone, or dolomite, weathering buff, dips in the direction N. 6 degrees W. at an angle of 42 degrees. Across the ridge to the southeast, at a distance of about three-eighths of a mile, is a second quarry, showing a like section, with the beds dipping S. 44 degrees E. at an angle of 33 degrees. At the east end, just north of Ninety-third street, there is a dip of 30 degrees in the direction N. 74 degrees E.
On the northeast slope, at Essex street, north of Ninety-second street, the dip is toward the northeast. On the north side of the ridge, about midway of its length, just north of Ninety-Second street, on Cloud street, there is a dip of 42 degrees in the direction N. 36 degrees W., and two blocks farther west, near Rupp and Ninety-second streets, the dip is 40 degrees in the direction N. 26 degrees W. At the west end the rock passes rapidly below the till, as a well just west of Stony Island avenue, between Ninety-second and Ninety-third streets, shows 33 feet of till overlying the limestone. This shows a decline of 48 feet toward the west in the distance of about one block. The rock is thus seen to have quaquaversal dips, and the elevation is the result of a local bowing or folding. It is inferred that the strata were once continuous over the fold, but the dome has been truncated by erosion and the edges of the bed have been beveled, smoothed, and striated by glaciation. The especially fine evidence of glaciation is discussed under the heading "Epoch of glacial occupation." It is possible that this "island" is an uneroded remnant of a much larger uplift since the elevation there is narrow and the dip of the strata is abrupt. If such is the case, the erosion has been very uniform on all sides, so that the remnant coincides with the axis of the fold. It may be, however, that the high dips are not entirely due to flexure or uplift. In the vicinity of Milwaukee, Wis., certain mounds of limestone in the Niagara formation show high quaquaversal dips which are evidently the slopes of original deposition about ancient coral reefs. While there is no evidence here of an ancient reef formation, it is quite possible that the present dips are but the accentuation of the dips assumed in the original deposition on a sea floor. Gentle undulations of the strata are noted at many of the other exposures, and some considerable dips occur, thought none so high as at this locality. If there were at this place an original bowing of the strata, a disturbance which resulted in the more gentle flexures might produce the high dips seen without forming any such extensive rock fold as might otherwise be inferred. The date of this disturbance is uncertain. The Niagara again appears about a mile to the southwest, on the place of Mr. Henry Schwartz, where it has been stripped of 3 to 6 feet of bowlder clay. At Thornton, on the Chicago and Western Indiana Railroad, there is a low elevation of limestone covering an area of 1.5 to 2 square miles. The village is on the southeastern part of the elevation. The rock has a relief of 10 to 18 feet above the plain to the north, and is but thinly covered by drift. About one-half mile north of the village, on the road to Blue Island, the rock is exposed with a dip of 20 degrees NE. In the southwestern part of the village is the quarry of the Brownwell Improvement Company. The strata have here a dip of 12 degrees SE, and the upturned edges have been smoothed and striated by glacial action. The quarry shows at present a 95-foot section. The beds increase in thickness downward from about 4 inches to 4 feet and are much fractured, so that no dimension stone is obtained. Near the surface the rock is buff and somewhat shaly, passing downward into a dense, blue gray, siliceous limestone. Mr. Brownwell states that the rock contains much bitumen or asphalt in pores and small cavities, and it also highly fossiliferous. In the bed of Thorn Creek, just south of the village bridge, the rock has a dip of about 24 degrees NNE. About 100 yards to the south the dip is in the opposite direction, toward the southwest, at a like angle, indicating a gentle local anticline. At this place the glacial striations are well shown. One mile south of Thornton, near the road to Glenwood, the rock is again exposed in the bed of Thorn Creek. About 2.5 miles south of Glenwood the Niagara is seen at Miller's limekiln and also in a road cut on the hill slope. The rock is an impure buff fossiliferous limestone, containing bitumen. West of the city, the northernmost exposure is seen a mile west of Elmhurst, on the Chicago and Northwestern Railway. The rock is here well bedded (see Illustration sheet 1, fig. 16) and shows abundant traces of organisms. The strata form a gentle anticline with northeast-southwest strike, and the surface shows glaciation. Some dimension stone is quarried. About 3 miles southeast of Elmhurst, near the Illinois Central Railroad, at the quarry of Kogle and Smith, is an outcrop of a grayish limestone, weathering to a dark-buff or brown color. The upper portion is somewhat decomposed and crumbling. Crushed stone and some building stone are obtained. The rock surface shows abundant glacial striations. As the rock is also seen in the railroad cut one-quarter of a mile southwest from the quarry, it probably forms the body of the small elevation at this place. About 3.5 miles south of Elmhurst, horizontal thin-bedded limestone is seen in the western bank of Salt Creek. The upper 2 or 3 feet are porous and yellow, passing below into an even-textured, light-gray limestone containing nodules of chert. The beds are fossiliferous. About a mile northwest of Lagrange, on the banks of Salt Creek, is a small quarry in light gray fossiliferous limestone. The rock is overlain by a few feet of fine stratified gravels and bowlder clay. About three-fourths of a mile northeast of this quarry, near the west end of the Ogden avenue bridge over Desplaines River, is a quarry showing gray limestone strata dipping N 32 degrees to 39 degrees W. at angles varying from 6 degrees to 20 degrees. About one-fourth of a mile north of the Santa Fe Railway bridge, at times of extreme low water glaciated rock surfaces are exposed in the bed of Desplaines River. The area about which the river here makes a detour is an elevation of rock, covered by 1 to 8 feet of bowlder clay. At McCook station, on the Santa Fe Railway, on the north bank of the Desplaines, the rock is again exposed in horizontal beds in the quarries of the Chicago Crushed Stone company. The present section is about 35 feet in thickness. The rock is coarse dolomite. Surfaces stripped of the 3 to 4 feet of stony clay show glaciation. Several excavations nearer the station show the same rock but thinly covered. One shows a slight dip of 5 degrees in the direction S. 31 degrees E.
Continuing southwest along the bottom of the valley about a mile, one finds to excavations showing yellowish-gray, well-bedded fossiliferous limestone, considerably weathered on the surface. Near these and about three-fourths of a mile north of the village of Gary on the Santa Fe Railway, is a quarry of the Brownwell Improvement Company. The quarry is about 45 feet deep, showing 2 or 3 feet of thin, broken, nearly horizontal strata at the surface, passing down into regular, little-broken courses from 4 inches to 2 feet in thickness. The rock is dense, even grained, and rather hard to dress. Mr. Brownwell states that its composition is 85 to 90 percent carbonate of lime, with the balance magnesia, silica, and alumina. It is chiefly converted into crushed stone for paving. About 3 miles west of Gary are two quarries near Flag Creek, in a local uplift of rock, showing dips of 9 degrees to 20 degrees in directions varying from N degrees 62 E. to N. 57 degrees W. The strata are here very much broken. The limestone is slightly exposed beside the road about 1.25 miles northwest from Sag Bridge station, on the Chicago and Alton Railway. Southwestward along the valley, from the Willow Springs bridge to Lemont, though no surface exposures are seen until near Sag Bridge station, the excavation for the drainage canal has cut into the limestone under the bowlder clay to depth varying from 1 to 25 feet, and, for the last 1.5 miles above the Lemont bridge the excavation is almost entirely in the rock, which here rises to form the valley floor. This shows the undulatory character of the rock surface under the covering of bowlder clay which forms the nearly flat bottom of the valley. In the mouth of the Sag for 1.5 miles eastward, the limestone is exposed or but thinly covered by a deposit of peat and clay. Here are the quarries of the Phoenix Stone Company. The present section is about 25 feet thick and shows a compact, even-tectured, light-drab to white limetone, well bedded in nearly horizontal strata, which increase in thickness downward from a few inches to several feet. The beds are undisturbed and little fractured, so that the product ranges from crushed stone and rubble to fine cut and sawed dimension stone. The rock surface, where stripped, is much waterworn, showing little grooves 3 to 6 inches deep along the fracture lines, crossing at various angles. With these are little potholes, from a few inches to a foot or so in diameter, ground out by pebbles whirled in water eddies. At the village of Sag Bridge, on the south side of the valley, the limestone outcrops in the road about 30 feet above the bottom of the valley. 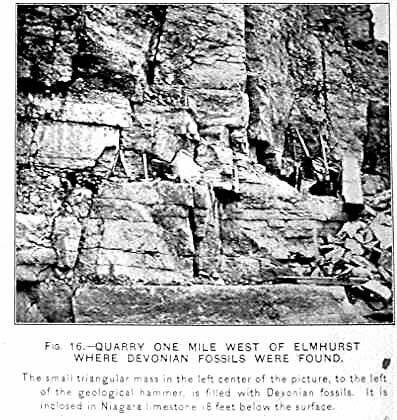 One mile east the quarry of the Calumet Stone Company gives a section, and northeast of here, on the north side of the valley, a small quarry furnishes a dense, fine-grained, light-gray to white limestone. The surface of the rock underlying the valley bottom, where exposed in the excavations for the Sanitary and Ship Canal, has given much evidence of strong river erosion. Large cavities, 5 to 10 feet wide and of a corresponding depth, have been cut through by the canal section. These have been taken to be potholes, ground out by stones in the eddying currents. 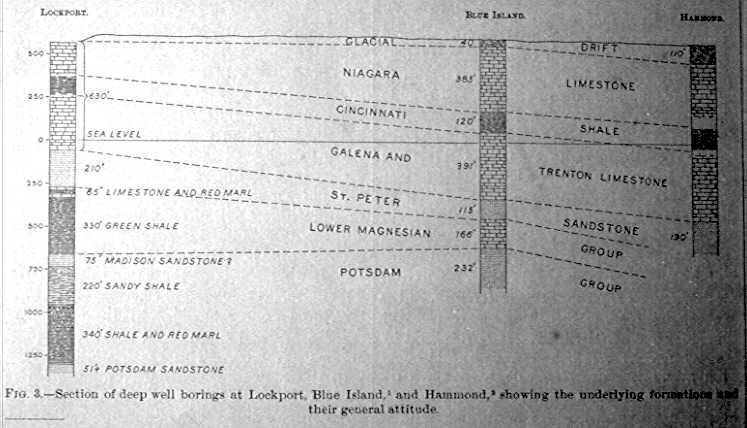 Dr. Bannister reports it as stated that the potholes in the surface layers at the Athens (Lemont) quarries, when of sufficient depth to penetrate one layer and enter another, are occasionally found to be dislocated; that is, one layer has slipped upon the other, so that the upper and lower portions of the pothole are, in some cases, entirely separated from each other. The phenomenon was not observed by Dr. Bannister, but seemed to be well attested. As he stated, this would see to indicate a horizontal disturbance of limited amount at a comparatively recent period. Mr. Ossian Guthrie reported them to have a bearing of about S. 60 degrees W. These have been regarded by some as glacial groovings, but Mr. Leverett thinks they are probably the product of river erosion. About 5 miles east of Orland is an exposure in the banks and bed of a small stream. The rock here is a regularly bedded, nearly horizontal, light-gray limestone, very fossiliferous. In the southwestern part of the area, at New Lenox and for about a mile west, Hickory Creek exposes the rock in its bed. It is also seen about 2 miles east of New Lenox, near the Rock Island Railway bridge over Hickory Creek. The exact stratigraphic relations of the beds seen in these various outcrops can not be determined. The character of the rock varies considerably within the area. In places many fossils have been collected, while in others the beds are almost entirely barren. the Cheltenham shoal, about three-eighths of a mile off Cheltenham Beach at Eight-second street, with about 9 feet of water. Until recently it has been thought that the Niagara limestone was the last of the indurated rock formations of which any trace remained in this vicinity. Such, however, is not the case. In northwestern Indiana deposits of lower Helderberg and Corniferous age and later Devonian shales are known to occur beneath the heavy mantle of drift, and in Milwaukee and Ozankee counties, Wis., deposits referred to the Onondaga and Hamilton epochs are well developed. It is also probable that the basin of Lake Michigan is very largely excavated in deposits of Devonian age. So it is not at all surprising that Devonian deposits should have extended over the region about Chicago. At this locality the limestone is much fractured by two sets of gentle folds, and joint cracks are well developed. Some of these cracks are several inches in width, and they are in general filled with black or blue clay. At one point in the east quarry face, about 18 feet below the glaciated surface of the rock, one of these joints is somewhat enlarged to form a narrow, triangular opening about 6 inches in width at the base and about 16 inches in height. This opening, instead of being filled with clay, as are all the other large joints in the quarry, is filled with a breccia composed of angular fragments of the adjacent limestone embedded in a dark-brown, arenaceous matrix. This matrix is abundantly fossiliferous, containing an immense numbers [sic] of fish teeth and a smaller number of Lingula shells and other brachiopods which indicate its Devonian age. The situation of this most peculiar occurrence of Devonian fossils, deeply buried in the Niagara limestone, is shown in fig. 16, Illustration sheet 1. The triangular opening filled with Devonian material is just to the left of the hammer and about 18 feet below the upper surface of the rock. Fish teeth: Ptyctodus calceolus N. and W., Diplodus priscus Eastman n. sp, Diplodus striatus E n. sp. Brachiopods: Lingula ligea H. ?, Orbiculoidea newberryi H. ?, Ambocoelia umbonata Con. The result of the study of the fossils is stated by Mr. Weller thus; "The presence of Ptyclodus is certainly indicative of the Devonian age of the fauna, but Diplodus has previously been recognized in Carboniferous strata, and the presence of two species of this genus with the Waverly species of Orbiculoidea would seem to indicate a very late Devonian age." The presence of the remains of this fauna of late Devonian age, deeply buried in the Niagara limestone, is very interesting and most significant. The absence of any species of earlier Devonian age would seem to indicate that during the earlier part of this age the strata were so far elevated as to become land. This land is thought to have been part of what was probably a large land surface, stretching from the Wisconsin land on the north to the Ozark land of Missouri on the south. Doubtless the shore line was no very far east of the Chicago district, since part of eastern Wisconsin and part of northwestern Indiana were submerged. During this elevation slight flexing of the rock strata produced the joint cracks in the Niagara limestone, and these were doubtless somewhat enlarged by solution by percolating waters. Doubtless, also, more or less of the upper part of the Niagara formation was cut away by erosion during the interval of exposure. Near the close of the Devonian age the land was submerged beneath the sea waters and the cracks in the sea floor were filled by sand and fine silts, in which were small shells and fish teeth. Coatings of this same material on the sides of cracks leading to the surface of the Niagara limestone show clearly that this was the mode of deposition of the material found. Besides this filling of the cracks in the sea bottom, doubtless beds of some thickness covered much of the surface of the Niagara limestone in this area. Were these beds, however, so friable as this remnant found at Elmhurst, they would have been readily removed by erosion during their exposure on the emergence of the area which followed. Heretofore, so far as known, the marine life of this region was confined to invertebrate animals. In some other places fossil remains seem to show that vertebrates appeared at an earlier time, but not until the Devonian submergence to these forms appear to have reached the northern interior sea. The evidence of so great an advance in the life forms thus give to those Elmhurst deposits an especial interest. Since the Devonian sea reached northern Indiana, Michigan, and eastern Wisconsin somewhat earlier than the time of its encroachment on the Chicago area, it is probable that vertebrate life was already flourishing in its waters when the submergence of the Chicago area took place. So far as known, the close of Devonian time was marked by the final withdrawal of the sea from the Chicago area. Certain evidence developed has suggested a possible resubmergence in marine waters at a much later date. This evidence is noted on page 10 of this folio. No indurated rock formations later than the Niagara limestone and the slight remnant of Devonian rock are known within the district. Upon these formations lies the heavy mantle of unconsolidated material referred to as drift (figs. 2 and 3). This drift not only overlies the rock formations here represented, but, extending out over the greater part of Illinois, and in fact over a large part of northern United States and Canada, it overlies rock formations of all ages, even the most recent; whence it is evident that the drift is the latest of all the great geologic formations of North America. It was deposited in the Pleistocene, the era immediately preceding our own. A large part of the rock formations of the continent was formed subsequently to the Devonian period, so it is evident that the interval between the deposition of the rock exposed in this district and of the immediately overlying drift was of enormous duration. During the whole of this interval, so far as known, the northern part of Illinois stood above the level of the sea. It is true there may have been, and indeed probably were, many changes in the conditions, due to variations in the elevation of the land and to other causes. There may have been intervals during which the sea waters again encroached upon this land, but no evidence other than that noted on page 10 of this folio has been found. The work of geological agents did not, however, cease in this region during this great interval. Up to this time the area of northeastern Illinois had been receiving contributions principally from the Wisconsin land to the north; during this interval the rock beds of this area were subjected to erosion and the material thus obtained was carried off southward by the streams, to help in the formation of other rock beds in the sea. So great was this interval of rock disintegration and erosion that the Devonian beds and whatever subsequent rock formations may have been present in this area were entirely removed. More or less of the Niagara limestone was also cut away at this time. As the rock disintegrated into soils vegetation developed and faunas of the air and land appeared, yet no traces of these faunas and floras here remain. The only evidence here is of destruction; one must go elsewhere to find the results of constructive work of post-Devonian and pre-Pleistocene time. With the deposition of the drift the process of rock destruction in this area practically ceased. This ends part 2 of The Chicago Folio by William Alden, 1902.